U.S. consumers are adopting e-readers such as the Amazon Kindle and Barnes & Noble Nook at a faster rate than tablet computers like the Apple iPad or Samsung Galaxy Tab. A recent survey by the Pew Internet Project shows that the share of American adults who own an e-reader has doubled in just six months to 12 percent in May 2011 from 6 percent in November 2010. Tablet ownership also rose during the same period, but at a slower pace than before. That's about the same as the 7 percent of adults who said they owned a tablet in January 2011, and only a 3-percentage-point jump in ownership since November 2010, Pew says. 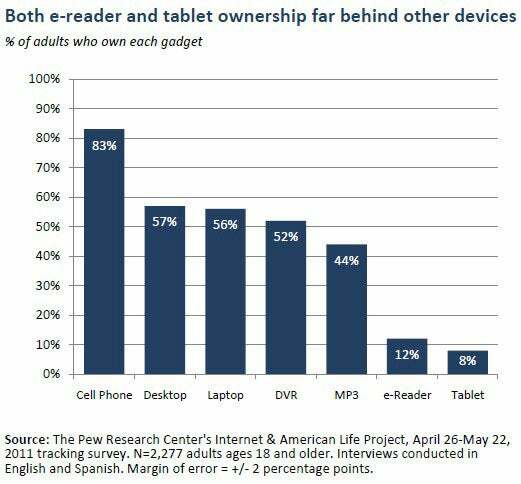 E-reader and tablet ownership lags behind other tech devices (click to enlarge). Prior to November 2010, tablet ownership had been rising at a relatively faster pace. The 12-percent estimate is a milestone for the e-reader. 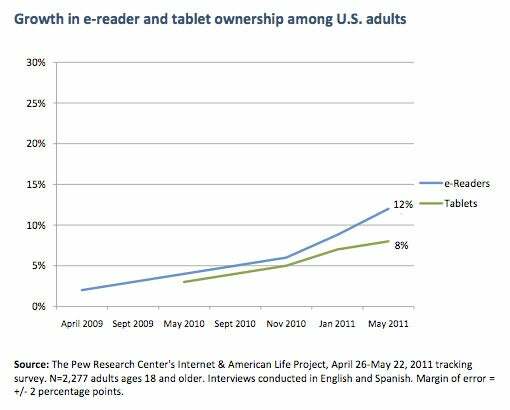 It's the first time that ownership of the device has reached double digits since Pew began measuring e-reader use among U.S. adults in April 2009. While e-readers and tablets are gaining popularity, both are well below adoption levels of earlier popular consumer tech devices, including cellphones, laptop and desktop PCs, DVRs, and MP3 players. Growth in e-reader and tablet ownership (click to enlarge). Mobile phones are far and away the most popular tech device: 83 percent of U.S. adults own one. Desktops and laptops are running neck and neck with 57 and 56 percent, respectively. The Pew Internet Project findings come from a survey conducted from April 26 to May 22 among 2277 adults ages 18 and up.